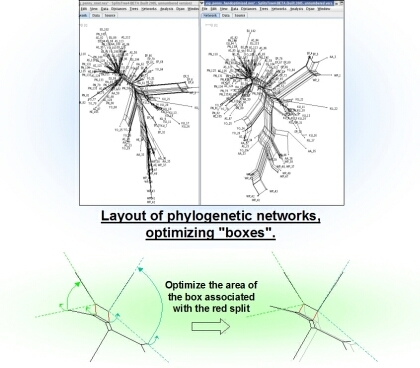 Optimizing the layout of phylogenetic graphs. To represent the evolution of some species or genes, the classical model is the phylogenetic tree. But trees are unable to represent horizontal gene transfers, recombinations and hybridizations. In those cases, phylogenetic networks are required. The SplitsTree software can represent many of those networks, in particular splitsgraphs. Those graphs represent conflicting signals in a phylogeny, with boxes appearing wherever evolution is uncertain. A splitsgraph can be obtained by a bootstrap on phylogenetic trees, or by a consensus of different phylogenetic trees, even if they have a different number of taxa. My purpose in this research training is to improve the layout of these splitsgraphs in SplitsTree, by increasing the area of the boxes which represent the conflicting signals in the phylogeny. I worked on this problem with Daniel Huson. Optimizing the layout of reticulate networks. When reticulations are added to a phylogenetic tree, the new edges created may intersect with existing edges. But changing the ordering of the taxa could lessen the number of such intersections. With Tobias Klöpper, our purpose was to find a heuristic to determine the ordering on the taxa which would minimize the total number of crossings. The one we propose is based on the dual graph of the phylogenetic tree, with a distance which reflects the number of intersections, and a mirroring process to improve this distance in a simulated annealing scheme. An article with Daniel Huson: Improved Layout of Phylogenetic Networks (TCBB, in press). Report in French and presentation (PowerPoint slides, PDF format) of this on research training (ENS Cachan, 09/15/2005, in French). Presentation on "Improving the layout of splits networks" (Power Point slides, PDF slides, 06/06/2005, Doktoranden- und Diplomanden- Seminar). 10 loops of the "box-opening algorithm".